The effects of September 11, 2001 are still reverberating across the world. The grief, pain and impact on the souls of those who lost friends and family is almost impossible to fathom and has continued to destroy lives and families. There are many untold stories that have been buried in the traumas that will continue to bubble to the surface as time heals the wounds for some. The effect on the 3,051 children left behind will be with them forever including the seventeen babies who were born later who never saw their fathers. Many awful truths are being discovered such as the 1,200 fireman and police officers that have died of respiratory diseases in those 10 years from the effects of the dust and toxins released in the aftermath of the world trade centre’s collapse. It has changed the world in many ways from security to travel. The world has lost part of its innocence and stolen some of its joy. These 5 infographics look at what has changed 10 years after that fateful day on September 11, from travel to security and the buildings that are rising from the ashes that display, commemorate and celebrate the spirit of the American people. Something we should ponder as we remember. 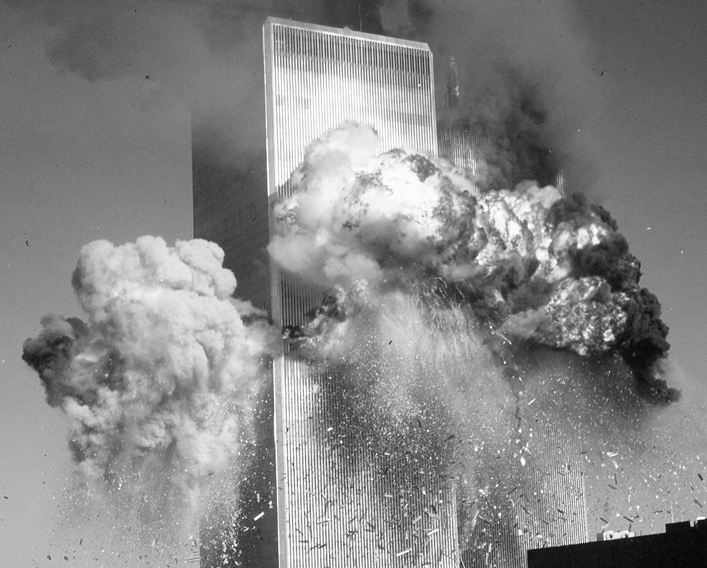 When the Towers collapsed they fell nearly 1/4 of a mile and reached speeds of 120 miles per hour. Two thousand fireman, policemen and volunteers were the first responders to the attack. 18,000 small businesses in Lower Manhattan were destroyed or displaced. Visas became more difficult for international visitors immediately after the attacks on the US. Car related deaths increased as people changed their travel plans from plane to road and rail. Researchers estimated that there were an additional 344 car-related fatalities during the 3 month period directly after September 11. After the plane hijacks all knives were prohibited, passengers were forced to remove shoes and all jackets had to be removed and x-rayed. In 2010 full body scanners became mandatory, resulting in a further loss of privacy. Out of the ashes a new World Trade Center and site is being reborn which will include the tallest building in the US at 1,776 feet. The structural steel for the new building contains 6 times more steel than is in the Eiffel Tower. The building will include 71 elevators and will take 45 seconds to reach the top. 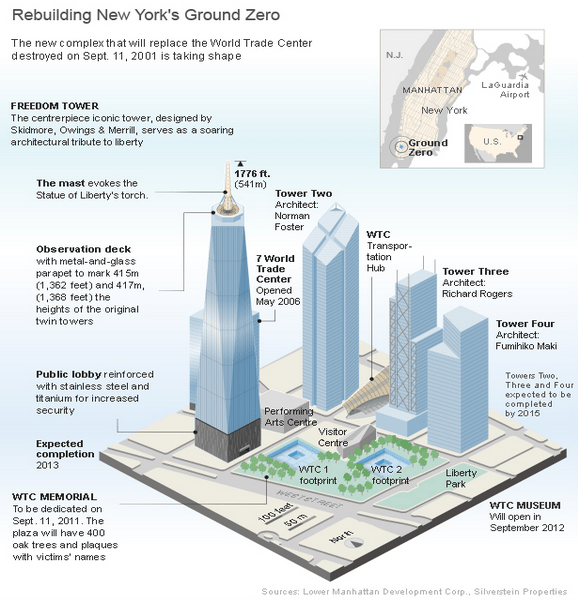 The iconic tower that will arise from the “Ground Zero” site will be named the “Freedom Tower”. The WTC memorial will open on September 11, 2011 and will include 400 oak trees and plaques with victims names. Where were you on 11th of September, 2001?